Does racism really need promotion? How does it make sense to unite people from the sub-continent and have them alienate themselves from the world that they are living in? Don't take movies so seriously, you say? Then movies should stop taking on serious issues! The movie claims that all whites love to hate all browns. So, all browns hate all whites right back! First, the claim is not true. Don't tell me whites and browns don't befriend each other at all. Second, given that racism does exist, does it need any more fodder? Way too many characters have been inserted just for the sake of representing a stereotype, including the Bangladeshi who takes a beating or is ignored all the time. Merely perfunctory. The motivation behind each character's metamorphosis is just a supposedly powerful, however clichéd, dialogue. Barring 2-3 funny lines, the rest are either lame, preachy, boring or all of the above. The story is a run-of-the-mill underdog story. No surprises there, the promos said it all. Also, as it says in so many words, it serves an "us vs. them" agenda, rather than a story of the underdogs. I am open to being aware of injustice done to people elsewhere, but I couldn't sympathize with the characters here. The screenplay consciously follows a pattern. Comic scene followed by emotional scene followed by a lighter one and repeat. The pattern doesn’t have rhythm. They do not flow into each other, they chop into each other. Was there any editing at all? I mean other than that necessary to join one scene to the other? I can recall at least 3 scenes that only served the purpose of giving John Abraham more screen time. And a few such scenes for Boman Irani, and almost all of Bipasha Basu's scenes. John seems to have added to his range of expressions. I enjoyed his attitude in the first few scenes that had him. But later, it wore off. Boman was made to yell and overact on occasion. Anyways his character was not strong enough to make me care. Bipasha - well she had no character at all. Oops...that was not how I meant it to come out, but you know what I mean. A non-male is needed in a story for it to sell, so we spend on her make-up and clothes. Who has extra money or time to spend on her characterization, etc? Let's just make her giggle and smile it out. A sports movie has tremendous scope for the cameraman. Especially a game with fast movements, like football. But the opportunity is not utilized to the fullest. We get nothing spectacular. Not to mention that the football action scenes are unsuccessful at deception - it is all too plain that there were stunt doubles. And the non-football field scenes are shabbily shot. The music and lyrics are below average too. In fact, realizing that Javed Akhtar wrote, "Hey dude, don't mess with me" for a team that doesn't believe in itself is sad. However, Choreography of "billo" is nice. But, these are only means to an end. The movie wouldn't have worked, even if the various departments of movie making were handled well. Sports movies in India are generally made around invoking some kind of patriotism. I am not saying they should stop doing that. But, why would I care about some county league in England for goodness sake!? My patriotism is not nudged by the woes of "browns" settled abroad for their personal progress. Don't get me wrong, I most certainly have nothing against people migrating. In fact, there is no learning better than exposure to a different way of living. But, the immigrants choose to live there for a purpose and the positives do outweigh the negatives. A huge percentage of South Asians staying abroad will identify with the movie. And I don't have such a romantic view of the world that I would deny the existence of racism. But, the world portrayed here is the imagery that lives in closed minds. By the minds that enjoy nurturing the "oooh-look-at-me-I-am-marginalised" feeling. How many people from this population who are doing well in their lives complain about racism? How many of the people who are not doing well would do well if they were in their countries? Ironically, you see an ad featuring Shah Rukh Khan on a UK street - which means people who recognize him are a big enough and important mass. Is the aim to reduce the racism or to fan it further? Sports many-a-time borders on war in real life. Do we need movies to do that too? South Hall County Club has an all South Asian Football team. They don’t have finances. They don't have good players. They don't have the confidence to win. See their road to overcome these obstacles. The jerky movement of the camera for the car scenes was good. The flashback scenes were shot well. The way it was not spelt out why John Abraham was not taken in the Aston team, but left the audience to decipher from other information given. I know very little about football. But, that a football team with such a loser for a goalkeeper can go from rags to riches amazes me. True, they should be given credit for not making him change overnight, but given that he didn't improve over the season, can a team really win consistently? The lighting in scene of a rainy night looked too put-on for an outdoor setting. Death of the county club owner. The most unconvincing death scene ever. How come so many people who lived abroad all their lives had no accent at all? The "thi, hai, rahegi" dialogue. (was, is, will be). How....yuck! Cheesy symbolic dialogues with the flower arrangement used as the symbols. Tony Singh's (Boman Irani's) contrived speeches. Why wasn't the team practicing before the interval? Dialogue between Shaan and Sunny in the hotel room. - Lame, inane, it had it all. Mother facing the father-son divide...oh p-lease! How come Tony Singh and Sunny's dad don't age over 20 years? The animated bird-view shot of the field and the animated fireworks! The soap-opera-ish twists and turns towards the climax. Shouldn't the loving, caring, doctor girlfriend run to he ailing boyfriend who might be dead as soon as the game is over, instead of cheering? The tell-tale signs used in the beginning of the movie to show the sorry state of affairs of the South Hall County Club were really sorry. Why was the English lady, Anne in soft focus/out of focus all the time? The matching of the prize money amount with that of the money required for the lease of the ground was all too convenient. Why were Dalip Tahil's co-commentators wearing constipated looks? Some people genuinely enjoyed it.. The Manchester united scene before the interval was really great! 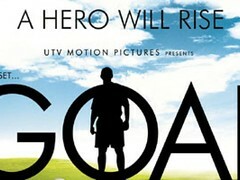 i love goal and john and arshad. they rok like hell. in our skool, we had sports day and the school soccer team did a few tricks on the song of goal, HEY DUDE! ISNT THAT COOL??!! i really wanna watch it. Alisha has posted 2 comments and has rated 0 movies. See Alisha's page for more details. all the people who dont like it are lame!